I’ve been trying to find a great banana bread recipe for a long time. I used to use the boxed mix from Trader Joe’s, but I’ve known for quite a while that I have to step up my game. I’ve tried a few different recipes, but none of them gave me the right results… until now. 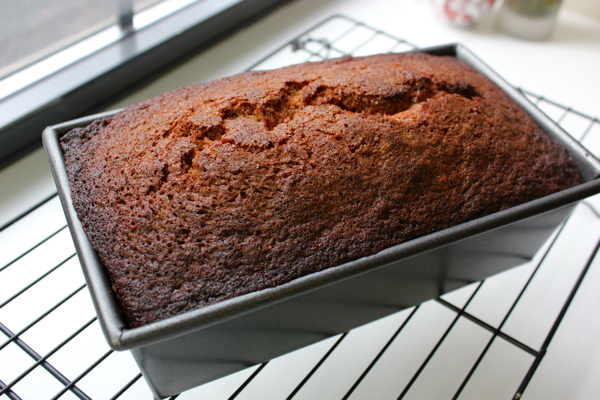 This banana bread is moist on the inside but crisp and chewy around the edges. 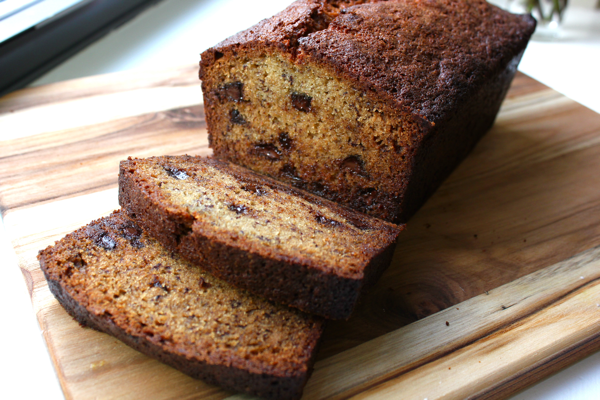 The banana flavor is just right, and the chocolate chips provide the perfect amount of texture and variety. As hard as it is not to eat this bread warm from the oven, it really is best on the second day after the flavors have had a chance to mingle. To make it, preheat your oven to 350º F. In a medium bowl, whisk together 1 3/4 cups of flour, 1.5 teaspoons of baking soda, 3/4 teaspoon of kosher salt, and 1 cup of chocolate chips. In a large bowl, mash up 2 very ripe bananas, whisk in 3 eggs, and then mix in 1.5 cups of sugar and 3/4 cup of vegetable oil. Pour the flour mixture into the banana mixture, and stir them together until they are just combined. 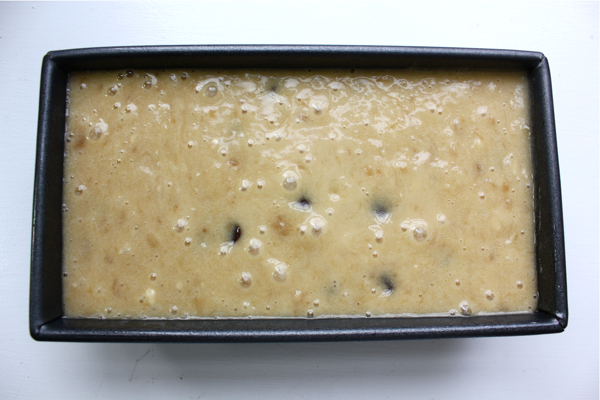 Grease a loaf pan, and then pour the banana bread batter in. Bake the banana bread for 60 to 75 minutes until it is fully cooked. You’ll know the bread is done when you can stick a toothpick into the top of the loaf and it comes out dry. If you think the bread is starting to brown too much, then you can cover it with a piece of tin foil while it finishes baking. When the bread is done, set the pan on a cooling rack. Once it has cooled enough to handle, you can pop the loaf out of the pan and let it cool even more. 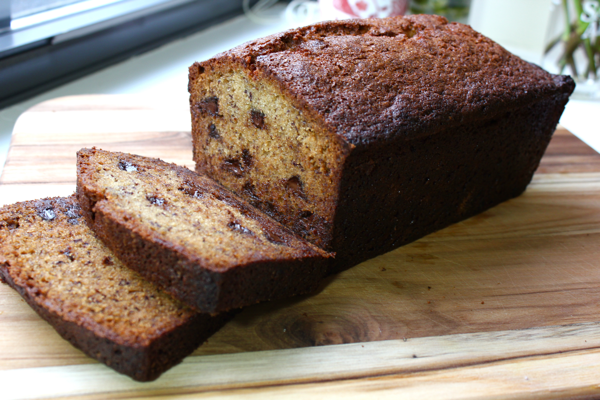 My favorite way to eat this banana bread is sliced, toasted, and smeared with butter. Delish. It makes getting out of bed in the morning just a tiny bit easier. Thanks for all the great food you’ve helped me cook!!! Thanks so much for your comment, and I am so so sorry for the mistake!! I’ll make the change, and I hope the next batch comes out much, much better for you! Take 2 was PERFECT! Another beautiful, simple and delicious recipe from you. Thank you!!! !